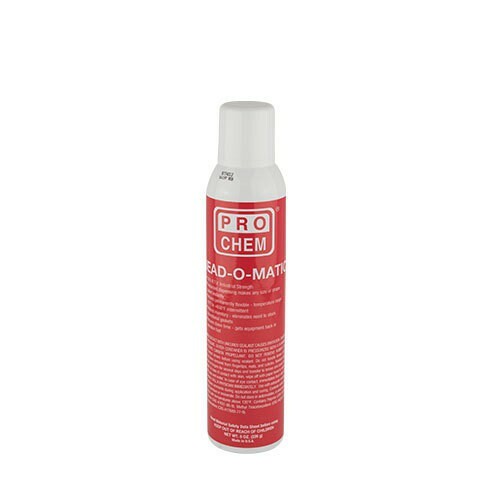 Bead-O-Matic | Pro Chem, Inc.
BEAD-O-MATIC is a red RTV (room temperature vulcanizing) sealant adhesive that will create a perfect even bead every time. Because it is made from 100% RTV silicone, it will make a strong and flexible gasket that is extremely resistant to both shrinking and cracking caused by heat cycling. It will not sag or shrink and is impervious to temperature extremes. Not recommended for use involving continuous immersion in gasoline or head gasketing applications. Paint will not adhere to cured material. Ideal for caulking windows, doors, ceiling crevices, as well as bonding nameplates, glass signs and machinery hinges. Surfaces must be clean, dry and free of oil, dirt and dust for the best adhesion. Apply a continuous bead of 1/16” to 1/8”. Dries in one hour, fully cures in 24 hours and reaches optimum strength in 7 days. Leave a small bead of material, which will form a sealing “plug,” then pull plug out before next use.